A small circle of men sat on chairs beating a drum in unison outside Montreal’s City Hall. 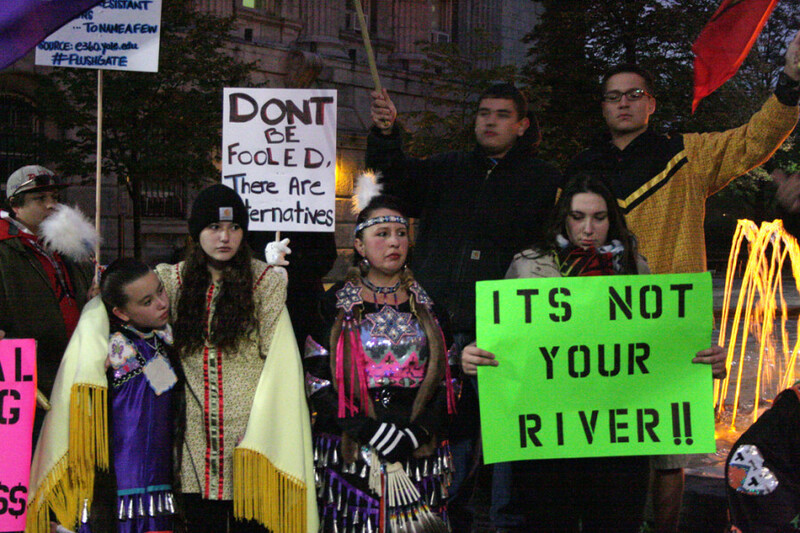 They, along with a swell of protesters, were dubbed “Protectors of the River” this past Friday evening. After some precursor roadblocks, the City of Montreal plans to follow through with an eight-billion-litre dump of raw sewage into the St. Lawrence River. Under opposition from the beginning, Montreal Mayor Denis Coderre has assured the city that he “didn’t have a choice” in the decision to release roughly 13 cubic metres of raw sewage per second into the river for seven days beginning Oct. 18—but activists and scientists think otherwise. “This could potentially have considerable short and long-term effects on the entire aquatic ecosystem,” said Grant E. Brown, a biology professor at Concordia University. He explained that many aquatic organisms’ behaviours are direct responses to chemical stimuli. This chemosensory is used to find food, to detect and avoid risk, and to find suitable habitats. Pollutants like hydrocarbons, wastewater and pesticides, can disrupt these cues, Brown continued. “These short term behavioural effects can snowball and have long-term population effects,” he said. Though the city of Montreal has assured the public that eight billion litres of waste will be diluted by the comparably massive amount of water flowing down the St. Lawrence River, it is unclear how aquatic life will be affected in any of the 26 source release points. Even though the pollutants can be diluted by the time it gets downriver, Brown says that high concentration at the initial dumping point can have dramatic effects on the local ecosystem. Perhaps the greatest threat to the St. Lawrence River’s aquatic life, however, is simply due to the rapid nature of this dump. Brown explains that increased foreign nutrients will create algae blooms, which will rapidly deplete oxygen sources. These types of immediate environmental changes can have considerable consequences on aquatic communities. “Unfortunately, people making these decisions are basing them on hydrodynamic models and economic models, not the ecological models,” Brown said. Despite Coderre’s attempts to alleviate worry, many Montrealers hold steadfast against the plans. The Friday protest was held at the foot of city hall with the express purpose of “saving the river.” Organized by several indigenous groups and activists, including many from Kahnawake, the protest bulged despite the rain. As drum beats roared, indigenous dancers performed before the crowd. At one point, the activists organizing the affair addressed the people there. “Tonight we’re here to protect the St. Lawrence River as much as we can. Everyone should get involved, not just Kahnawake—everyone along the river should participate,” said organizer Karina Okwaho. Okwaho respects that Coderre may not have other alternatives, but she argues that the sewage must be filtered first to minimize the effects. “The three problems we’re going to have—the floating objects, the medical waste, and the pollutants—those are going to affect our river,” she said. Sunshine Deer, an activist from Kahnawake who was dancing at the protest, echoed Okwaho’s thoughts, saying the city has the money and resources to filter the sewage before dumping it. “They’re killing the environment. This is our mother Earth,” she said. The protest held out through the rain, culminating in the formation of a large dance, in which protestors linked arms and moved rhythmically around drummers at the circle’s centre. After a while, the activists packed up and headed home. Department approved this month’s plans back in February. Though Environment Canada has had information regarding the dumping plans as early as September 2014, Environment Minister Leona Aglukkaq asserts that her office only learned of the plans at the beginning of this month. In the wake of so much opposition, Quebec Premier Philippe Couillard announced his support for Coderre’s lesser-of-two-evils plan. “Each time we’ve looked at this and Mayor Coderre and his team have looked at this, we always come to the same conclusion,” he told The Canadian Press. Environment Canada is expected to give their full response to Montreal’s dumping plans on Tuesday.